Just wanted to say hello, and thanks for all the amazing info aggregated in this forum. Got her last Saturday, ~300 miles already and some parts on order. Big Gun Evo, Dynojet kit, Edge-2 tail kit with 12oclock board, nomadic rack. Maybe more in the near future. This is just the stuff I need to clean up the look, carry my crap to school, and give the bike a little more pep to carry around my 280 lb ***. Finally got sick of my Buell breaking every 3 weeks, decided to buy something new, with a warranty, that would be perfect for around campus commuting. Welcome Nic! You're going to love the 250. Welcome. Nice choice in beer. Last edited by EMS_0525; 03-07-2012 at 01:21 PM. Nice looking bike Nic. Love the blue rims. LOL two , three legged cats. 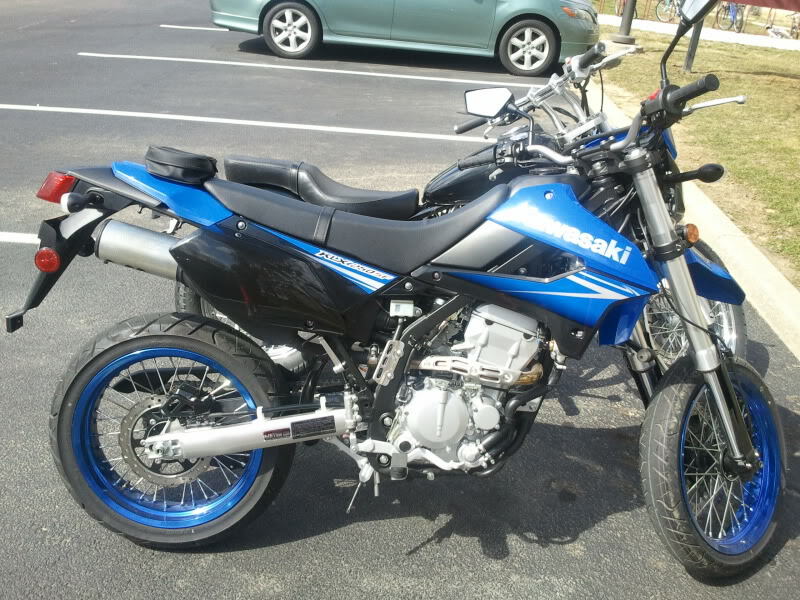 Hi Nic, I just picked up a 2009 250SF from Bloomington Powersports 3 weeks ago and I love it. btw 3 cats 4 legs each. John. Thanks for the welcomes guys. Also, John! I came in the day after you bought yours and tried to buy it. I had to go down to Linton to pick mine up. Mind me asking what you paid for it out the door from Bloomington Powersports? Feel free to PM me if you don't want to share it publicly. Also, if you are close to Btown, we should go riding sometime! Yeah, about the cats, I am a sucker for unloved animals. Quick Reply: Hi from Indiana, new KLX250SF owner.